The course aims at describing the field of Ambient Intelligence (AmI), outlining its multi-disciplinary nature and its technology and application areas. The evolution of consumer electronic technologies, of wireless networks, of sensors and the ability to represent and process knowledge and data on a large scale, nowadays allow the conception of intelligent environments able to handle, in an optimal way, energy-related variables, comfort, safety and user interaction. Such scenarios spur a variety of solutions, ranging from smart homes to smart buildings, from smart cities to smart transportation systems. Special emphasis, on the course, will be devoted to design-related aspects and on the overall hardware-software architectures, besides reviewing the involved technologies. This will enable the conception and realization of reusable and interoperable solutions. The course will include some seminars given by industry experts. Writing system specifications and high-level design of an ambient intelligence system, starting from its functional and behavioral requirements. Realization of intelligent scenarios over real smart environments. Technologies involved in the design and realization of intelligent environments, at the various architectural levels (sensors, domotic networks, wireless sensor networks, residential gateways, stream data processing, big data analysis, user interfaces). Application of user-driven design methodologies. Students are required to engage in design and implementation of real-world intelligent environments. They are required to team-up around project ideas individually proposed and socially ranked. Teams are composed by 3 students on average, and select the project to carry-on throughout the course. Final outcomes are publicly reachable (see below for current projects). Learn more about the course by visiting http://bit.ly/polito-ami. Video lectures are freely available on a dedicated Youtube playlist and on the teaching portal of the Politecnico di Torino. Most people spend the most of their time far from home. Imagine if you can be advised everytime someone is on your door and actively interact with him/her as your are actually at home. 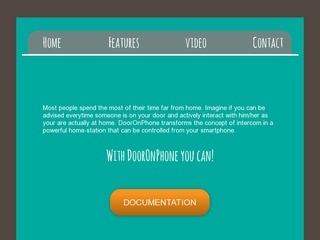 DoorOnPhone transforms the concept of intercom in a powerful home-station that can be controlled from your smartphone. The purpose of this project is to help improve the efficiency of a computer lab by controlling the power of the workstations and the lights based on user inputs. 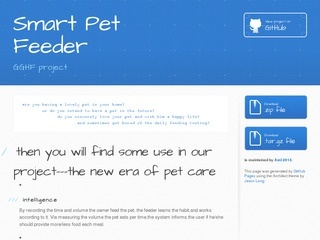 The Smart Butler project aims to create a system able to substitute a human butler in a domestic environment. 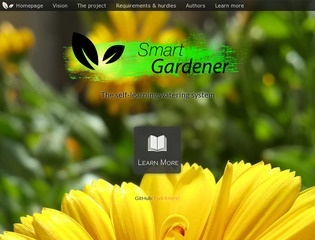 Smart Gardener is a project that would allow you to enjoy plants while lifting you from the task of watering them. It would also optimize resources by avoiding watering if rainfall is forecast in the near future or if the day will not be particularly hot. Feedback from the plants allows to tailor irrigation cycles to their specific needs without manual input. 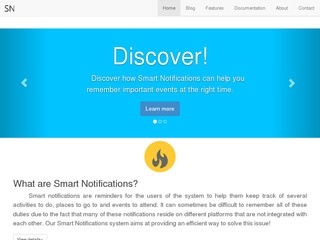 Smart notifications are reminders for the users of the system to help them keep track of several activities to do, places to go to and events to attend. It can sometimes be difficult to remember all of these duties due to the fact that many of these notifications reside on different platforms that are not integrated with each other. Our Smart Notifications system aims at providing an efficient way to solve this issue! The system recognizes the hand raised and assures the reservation for getting help from the tutor. Sensing: A webcam, placed on every workstation, sends continuously images to a program able to perceive the raising hand gesture. When a student needs help he rises his hand, until the gesture perception will be notified to him. Reservation: The request is sent to a priority queue manager running on a Raspberry Pi. Communication: The manager notifies the tutors of the next student to whom provide help, through a smartwatch or a smartphone. 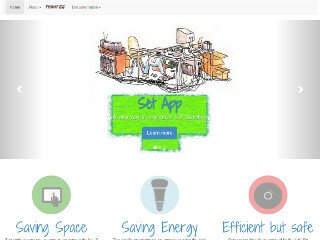 Smart Management: The queue is managed in a intelligent way to optimize resources." Improvements in technology have in the latest years lead to a new vision of gaming which introduce the player in incredible scenarios, where computer graphics and artificial intelligence take the user in another dimension, from time to time more realistic and enjoyable. Our purpose anyway is different, our clue is to bring software and technology in the scenarios of the real world and not vice-versa, and to exploit the greatest GPU available in the market: the users' brain! 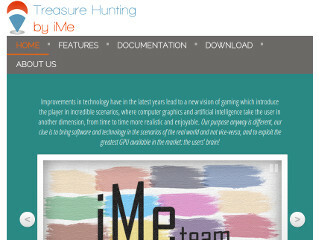 Mainly the game consists in a treasure hunt controlled by a central computer which works as creator of the paths and clues to solve in order to find the treasure and win the match, but don't worry, you're always under control! What if you could come home to a comfortable and warm environment? What if you could forget about controlling your home's heating system? What if you cut down your energy bill without doing anything? What if you never run into a cold shower again? What if could wake up to a hot cup of coffee? What if you could buy a product that did all this and more for you? At PiSquared© we have worked hard to ensure our customers find more than what they are looking for. 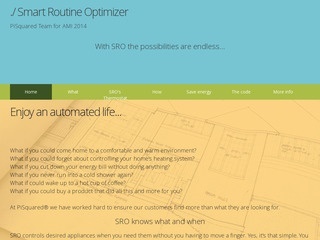 SRO controls desired appliances when you need them without you having to move a finger. Yes, it's that simple. You can sit back, relax and enjoy life while SRO does the tedious things you would rather not do. Lowering the temperature at night to save energy, turning on the shower's heating system in the morning, the coffee machine, the TV, the alarm when you're gone... are all things of the past. 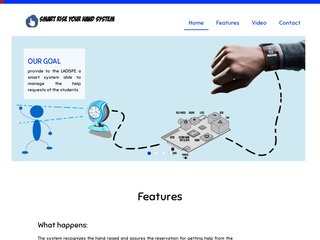 The idea of the project consists in preventing the user from leaving the room forgetting important objects such as wallet, phone, keys and similar objects. Everyone can benefit of the system because it exploits low cost hardware and doesn't require any direct interaction. When the user is leaving the room, the system can detect if he's not carrying some important object and warns him in multiple ways. 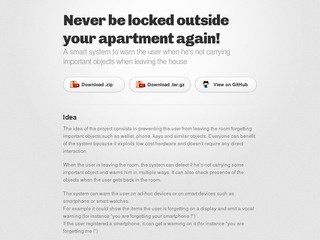 It can also check presence of the objects when the user gets back in the room. The system can warn the user on ad-hoc devices or on smart devices such as smartphone or smart watches. 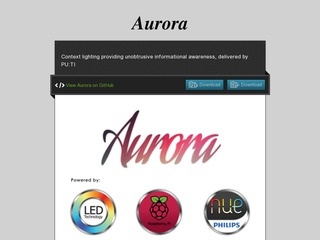 Aurora is an intelligent lighting system which displays useful information through light and color changes. The lighting system is designed to provide notifications through subtle variations, without disturbing the user with flashes or sounds. 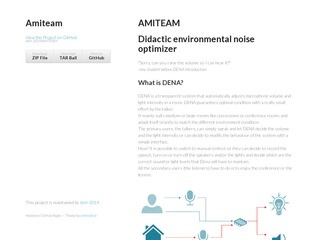 DENA is a transparent system that automatically adjusts microphone volume and light intensity in a room. DENA guarantees optimal condition with a really small effort by the talker. It mainly suits medium or large rooms like classrooms or conference rooms and adapt itself instantly to match the different environment conditions. The primary users, the talkers, can simply speak and let DENA decide the volume and the light intensity or can decide to modify the behavior of the system with a simple interface. How? It is possible to switch to manual control, or they can decide to record the speech, turn on or turn off the speakers and/or the lights and decide which are the correct sound or light levels that Dena will have to mantain. All the secondary users (the listeners) have to do is to enjoy the conference or the lesson. 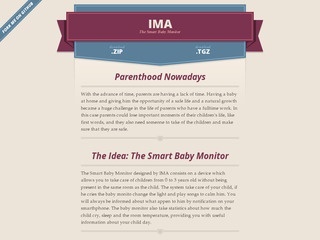 The Smart Baby Monitor designed by IMA consists on a device which allows you to take care of children from 0 to 3 years old without being present in the same room as the child. The system take care of your child, if he cries the baby monito change the light and play songs to calm him. You will always be informed about what appen to him by notification on your smarthphone. The baby monitor also take statistics about how much the child cry, sleep and the room temperature, providing you with useful information about your child day. © 2014 The e-Lite group.